Last time, I mentioned that the reason why Mushishi is considered “high art” is because of socially agreed upon ideals about what good storytelling is. Let me briefly go into more detail into how this applies to Mushishi. 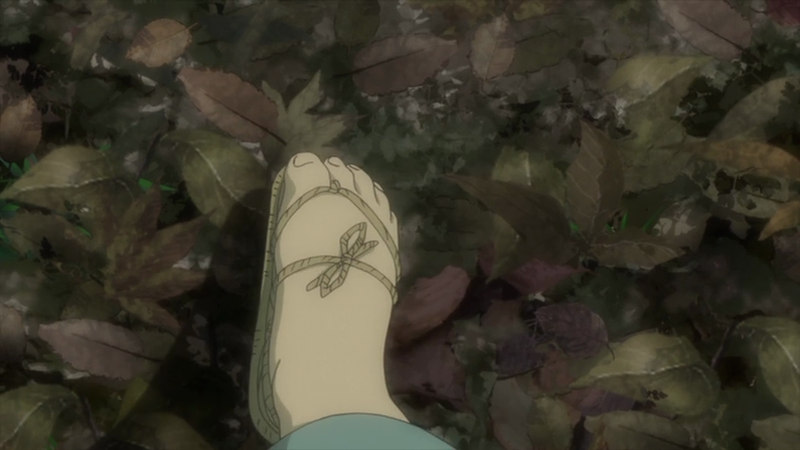 Mushishi builds itself upon traditional Japanese aesthetics. Aesthetics is our appreciation of beauty, often in nature and in art. Traditional Japanese aesthetics are drawn from the concepts of Zen Buddhism, which emphasise appreciating the imperfections of nature and the imperfections of life itself. Without delving into all the terminology and culture behind it, you can still easily appreciate the results. A work heavily influenced by Japanese aesthetics is often tinged with melancholy; the emotional range is subtle. It feels a little sad, but beautiful because of that sadness. This aesthetic is most often associated with high-brow Japanese literature and art, but it does pop up in anime everywhere, most obviously in depictions of sakura petals and crimson autumn leaves. Other works also structure their stories around the aesthetic, including Natsume Yuujinchou, 5 Centimeters Per Second, Hyouka and, of course, Mushishi. The reason why this aesthetic is so highly regarded is because it does move and touch the audience in unexpected ways. It is universal and not strictly “Japanese”, although it is often written about that way. It feels exotic and nostalgic, both to a Japanese and to a foreign audience. When you compare this aesthetic to the mishmash of styles and influences in modern pop culture, it is no surprise that many long for the simplicity and poetic sense of deliberation of the former. 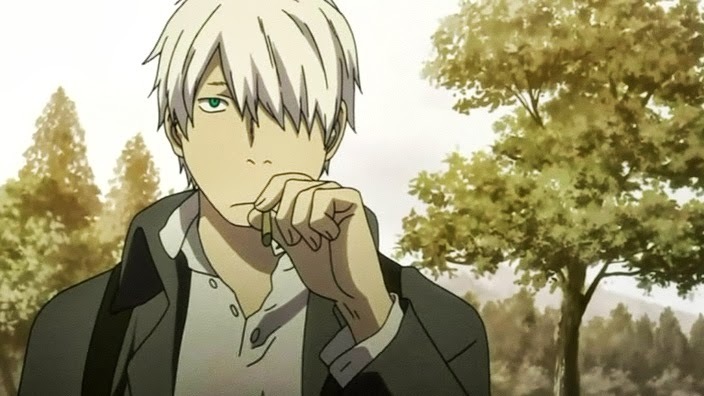 I personally regard Mushishi as the most complete statement on Japanese aesthetics in anime. Each episode articulates a different aspect of Zen philosophy, and overall, they paint a picture of a world that is both alive and still, unforgiving and kind. Ginko serves as the mediator between mushi and humans, but he is also the bridge between tradition and modernity, the world of the anime and the world of our own. This all, of course, brings us back to our central question: how would you write a Mushishi? While it’s easy to sit back and appreciate the aesthetics, even the most naturalistic art had to have been crafted by someone. Picking apart a work of fiction shouldn’t just be reserved for bad fiction. On the basic, fundamental level, Mushishi expresses itself through visual language, so it would be inappropriate to only write about how the episodic stories are put together. I’ll just pick apart the first episode of the second season, since this episode should still be fresh in the viewer’s mind. I will not go into much detail about the nitty gritty of animation. I’m only familiar with the barest concepts of how the animation process is carried out. Instead, I’ll focus on a couple of key screen shots and describe how I think the shot was framed. 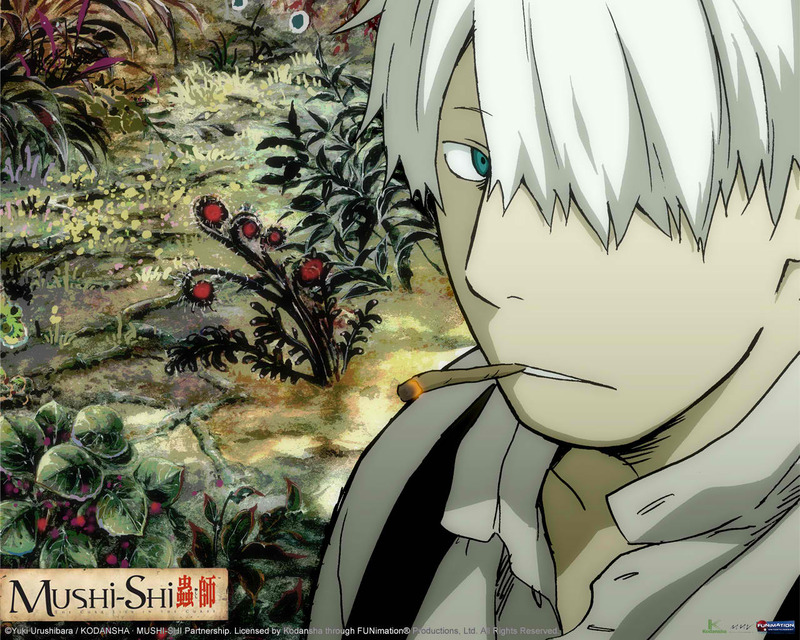 In general, Mushishi makes use of a very subdued, earthy colour palette. You can, of course, get this sort of tone by mixing green and brown shades together. Pay attention to how the image is layered. Notice how the character animation differs from the background of the leaves. The foot seems much more two-dimensional, while the leaves are almost photo realistic. The leaves seem to blend into each other because the shades are smudged together. The hints of bright green are probably from the first layer of the drawing. Then the darker hues are painted over it, and finally, the distinct outlines of the leaves are drawn into the background. The very last step is the character animation. The overall effect makes it look as if the characters in Mushishi are walking through a painting. We should take a moment to appreciate here that it is western-style landscape paintings that Mushishi is striving for here, not Japanese-style painting. I think there are pragmatic reasons for this: first of all, it’s just easier to animate. Second of all, it gives off the impression of a “fuller” natural world. This tends to enhance the visual appeal of animation, since it gives off the illusion of the anime world being bigger and more vibrant than the real world. “Hyper-real”, you might call it. The mushi don’t stand out quite so much because they’re not so bright. The idea is that they seem abstract and surreal because they lack elaborate shading. Both in the narrative and in the actual animation itself, the mushi exist on a different plane than the landscape and the characters. You can really see how the mushi are practically pasted on the screen. They also shine with an ethereal glow. This really emphasises the distinction between the natural and the supernatural. At the same time, the special effects are muted. 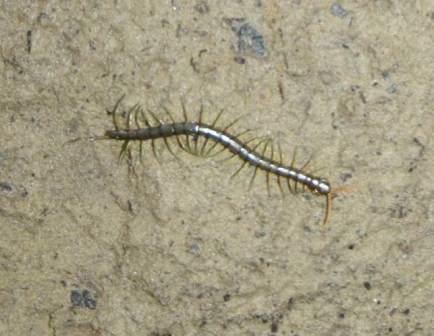 The mushi tend to slide and slither through the screen. This effect can be drawn mostly through observing animals in their natural habitat. A big part of Mushishi’s storyline is that the mushi are just another part of the ecosystem, so their movement patterns are modelled off insects. You can create mushi designs too if you spend enough time in the dirt, watching nature and observing how it comes alive. Another simple way to convey the natural environment is through sound. Play any Mushishi episode and you should notice that the BGM is very muted and only plays at key scenes. Most of the time, you can hear the sounds of nature: bugs chirping, water flowing, the rustling of grass. What’s notable is that these sounds are never exaggerated to emphasise that this story takes place outside of a city setting. You don’t hear the cicadas quite so loudly as in other anime, for instance. Mushishi’s sound scheme isn’t fully realistic. There is less background sound in Mushishi than what you would really hear if you spent any amount of time in a dense forest. I believe this is deliberate. It draws attention away from the the superficial aspects of nature and focuses on the quiet, inner tranquility you feel when you meditate with nature. Again, this is the anime trying to feel more real than what is real. You might be noticing a pattern. All these different techniques all work towards achieving the one thing. The way the shots are framed creates a greater emotional impact than the words being told. The narrative gives us a framework, though, and that gives the visuals meaning. Consider this final lingering shot from the first episode of season 2. In it, the sake brewer (his name is given to us but is ultimately not important) stares up at a night sky filled with mushi he would not normally be able to see. To him, it is mere fantasy – a separate reality that he knows exists on some level but cannot fully accept. But we can see from his actions that he wants to believe in it and his imagination is drawn to it. The reason this moment is so poetic is because it captures that feeling of inbetween-ness. This is built up slowly yet carefully. We see the essential stages of the sake brewer’s life – with a feeling of disconnect. The viewer is not invited to get into his head. Rather, the character is left to narrate his own thoughts, and he is shown from a distance. He exists, not as an audience stand-in or as his own character, but as another member of the human race. This is portrayed not just through the distance through which the camera looks at him, but also through his lines and how he speaks them. 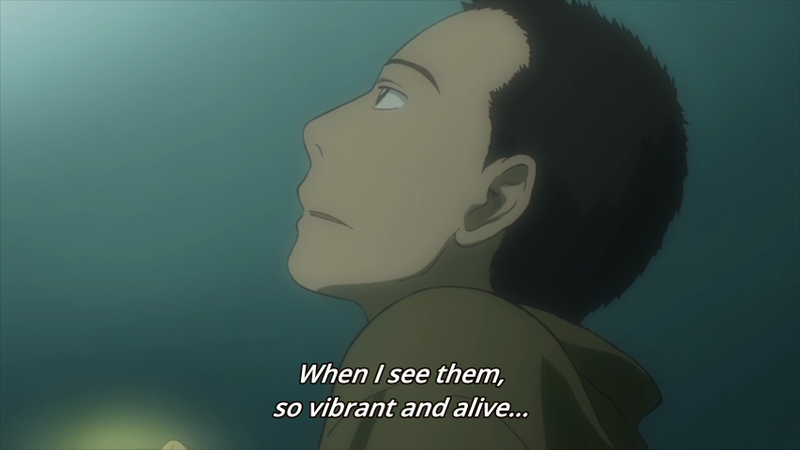 Mushishi generally doesn’t use well-known actors but instead casts ordinary people to act as ordinary people. It definitely shows in the down-to-earth manner this character speaks and in the simplicity of his lines. This simple dialogue, however, is worded in a deliberately vague way. The words themselves are easy to understand and there is an obvious meaning to them in the context of the scene. They are so effective because they are used so sparingly. This brings more attention to the lines themselves. It invites the viewer to look for what is universal about the lines – what are the characters saying that feels somehow true? These are words that perhaps anyone would utter to themselves when they appreciate something beautiful and keep coming back to it. The lines resonate because of context and because of the accompanying sounds, but also because they are true. How to write lines like this? A lot of it comes from trying to write not what seems clever and self-aware but what seems true. Think about what people actually say and how they tend to feel about things. There is invariably some crossover. Trying to find that middle ground between poetic truth and real truth is the author’s eternal quest. 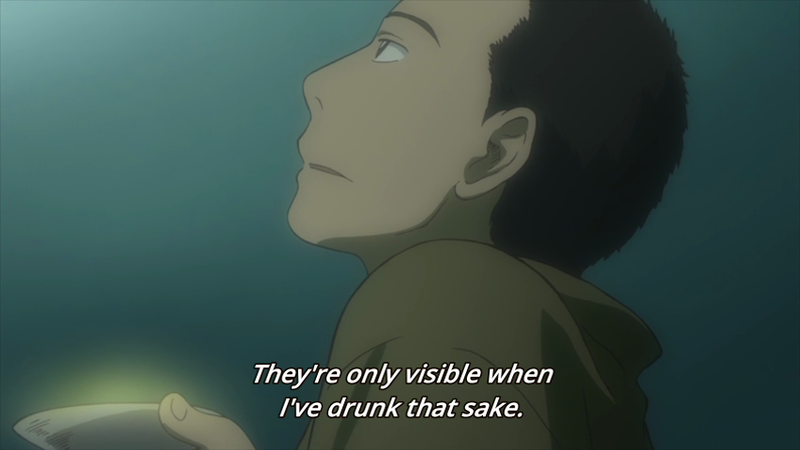 I might have written that Mushishi is regarded as high art because of socially constructed ideals. Still, there is a reason why those ideals were constructed in the first place. 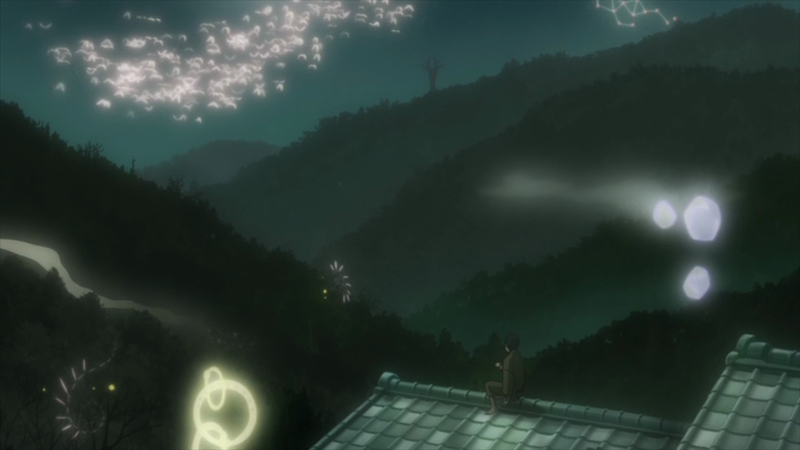 If no one was able to relate to the story and aesthetic of Mushishi, no one would have said it was worth aspiring to. 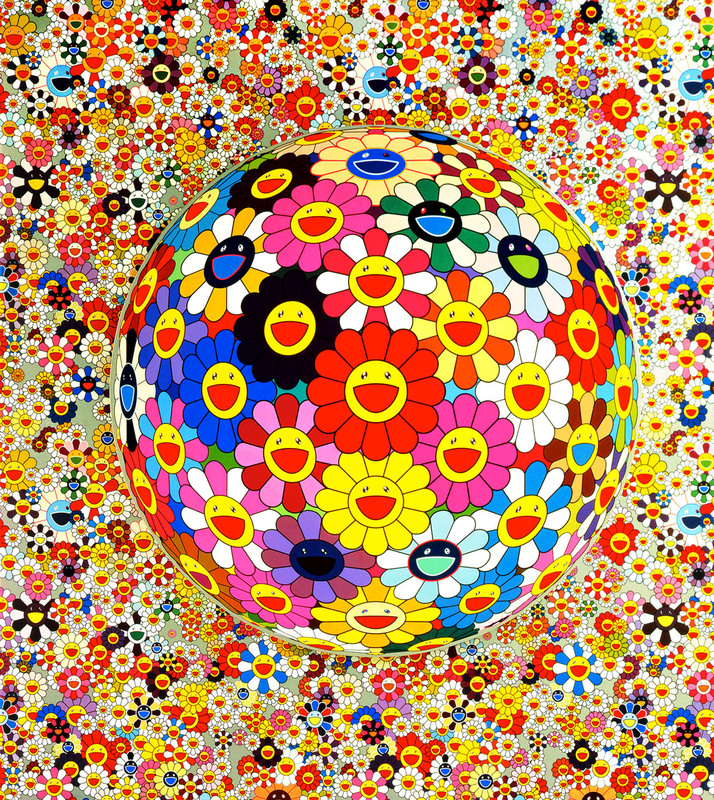 Ultimately, social ideals about art do signify something. As humans, we might all be different, but we do have many shared values because we draw influence from each other. 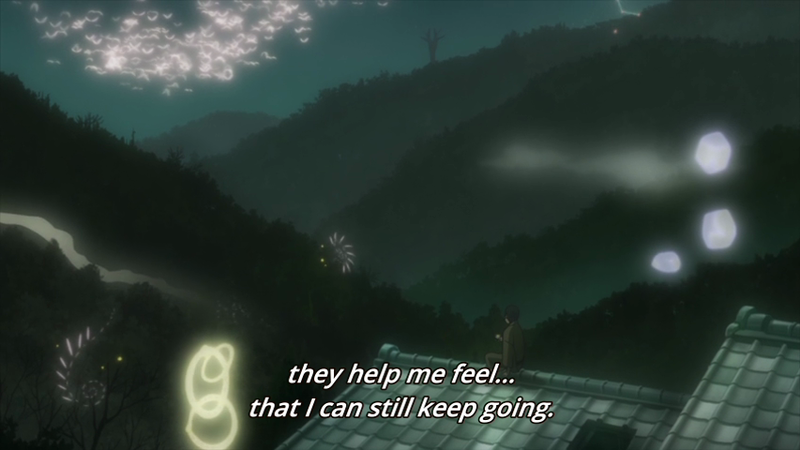 What this means is that while Mushishi might not move everyone deeply, it is bound to move someone. So if you haven’t watched it, please give it a shot. A lot of deliberate thought and craft went into making this anime, as you can see, and this brief little article completely fails to do it justice. But perhaps it made you appreciate what Mushishi set out to do a little better and how it managed to achieve those things. Perhaps you even learned a little something about how art and stories are made. This was a difficult post to write. It covered a lot of topics I personally feel very ignorant about. It challenged my thinking a lot. In any case, I’d be happy if you got something out of it, too. 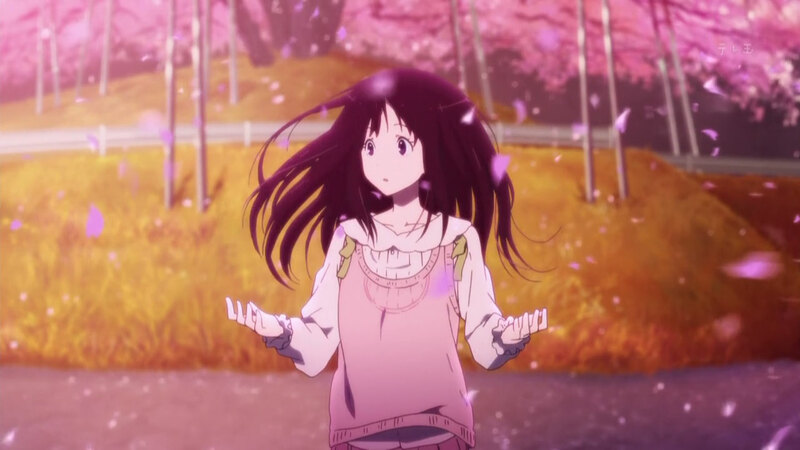 Posted on April 11, 2014, in Anime Analysis and tagged 5 centimeters per second, hyouka, mushishi, natsume yuujinchou. Bookmark the permalink. 16 Comments. I’d have Ginko be challenged by his long lost rival, Blinko, to a game of Mushicards. Ginko would release his Stag-King Beetle and use his mighty Horn of the Black Pincer special effect to penetrate the hard, defensive cocoon of Blinko’s Nuclear Cockroach. But the negative effect would be negated by Blinko’s Purified Spring Water item card. Would Ginko be able to defeat Blinko and reclaim his long-lost twin daughter (or something)? Find out on the next episode of Mushicards! Oh, and there’d be lots of glowing light and stuff whenever they draw a card and super cool explosions. Is Ginko still a chain smoker in your story? Have you ever seen Kino’s Journey? Judging by the way you framed (ha) the show in your post, I think the two series have quite a bit in common. I have seen Kino’s Journey! I liked it a lot – and it is indeed very thematically similar to Mushishi. Kino’s Journey leans more towards Buddhist philosophy and Mushishi leans more towards Shinto, but both are fantastic portrayals of Japanese aesthetics imo. YOU DON’T MARATHON MUSHISHI IN A DAY OR TWO. Although I guess you’ll realize it yourself that each episode leaves you with so many feelings that you can’t put a name on them, that any attempt to watch many eps together becomes overwhelming. Zen doesn’t mean taking things slow either, but rather doing them purposefully :p.
(I mentioned Zen due to its relation with meditation, thus with a slow prodecedure). I guess everyone has his/her own pace. I just talk from my experience. KnT I could watch multiple episodes a day. That certainly didn’t happen with Mushishi. Kino no Tabi mostly engaged my mind. Mushishi is mainly experienced viscerally imho. 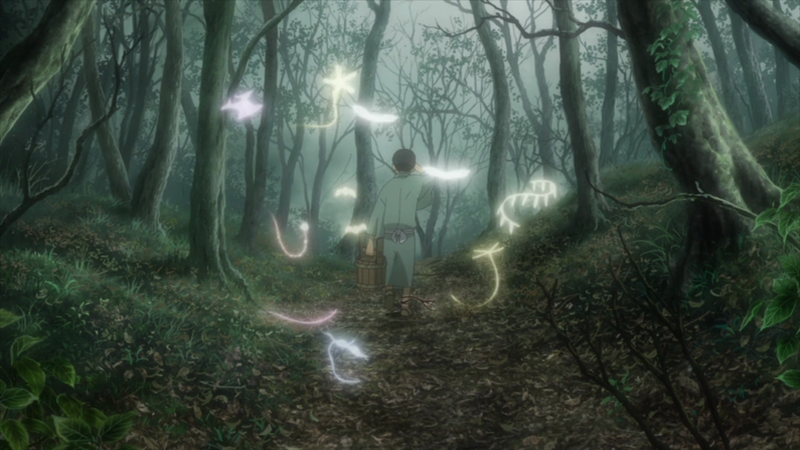 Oh man though – now I’m 120% stoked to start watching Mushishi! I don’t really have anything meaningful to add to this – I just wanted to pop in to quickly say that I really enjoyed this article, and think you did a very fine job in writing it. I hope that doesn’t sound patronizing in any way; I genuinely think you’re an excellent blogger. I only wish I had more intelligent responses to your posts, but I guess most of the time I feel like I don’t have all that much to say. Still, reading them is a pleasure. You’re welcome! Glad you could get something out of this post.